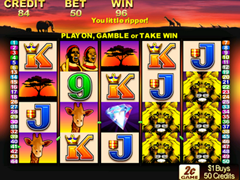 Aristocrat Gaming created this colourful pokie with the most beautiful sunsets and the wild life of the Africa Safari. Spoil your eyes with outstanding graphics on 5 reels with 50 paylines and fill your wallet with incredible wins. A large group of features eagerly escorts players on this safari to ensure additional wins are part of the trip with, scatters, free spins, wilds and multipliers. The trip gets even better with an outstanding payout of 1.000 coins from the jackpot bonus round. 50 Lions can be played with multiple wager amounts. You can choose multiple ways to play the game and get the best wager for your pocket out of each spin. At least 1 coin will be wagered per line played. You can choose to lay multiple lines up to 50 per spin. This will mean you will wager 50 coins. The game will allow for 100 coins per line, which gives you a wager of 5,000 coins. Each coin is valued from $0.01 to $0.10. Escape all the daily stress and let your imagination flow over the horizon where the sun is about to set. Outstanding graphics brings the lion racing with energy when he is part of a winning combination, the diamond twirls in rays of pink, the impressive symbols selection also includes giraffes, zebra, red protea flowers, African singers, silhouette of a tree in the sunset and the pokers symbols in bold fonts offered in different colours. 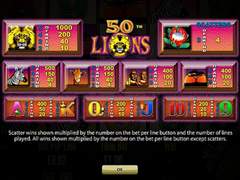 The 50 payline numbers are offered on bright colour tabs on both sides of the reels and the functional buttons are conveniently placed below the reels, with the credits, bet and win amounts displayed on the top of the screen. The African lions are the wilds that can run up to any of the reels in prides of 4 symbols per reel. This means you will be able to get 4 wilds on each reel and possibly fill the entire game with these symbols and unlock massive wins. Each of the lion symbols will be able to stand in for others when show in a place where it can substitute and complete a line. The scatter symbols are depicted by the African flower with red and green leafs. The game will need to see at least 3 scatter symbols before pay-outs are made from the symbol. When 3 of the scatter are shown the game will award 4x the bet amount. Free games will only be provided once you gather 3 flowers. The game will first give you the wager multiplier before awarding you with 10 free games that features a 3x multiplier for each of the wins gathered in the feature. Additional wild diamonds are added to the last 4 reels that will generate more winnings while the game in played. A re-activation can take place to receive 5 more free games. Exceptional graphics offered in smooth animation is offered by this pokie and great rewards are offered for wins. The great line-up of features assist continuously with additional wins. This is a pokie that deserves a try as it will impress players from the colourful start.